For about a decade, I split my time between Chiang Mai, Thailand, and a hectic business life in the U.S. Chiang Mai was my sanctuary from the stress of living and doing business at home. A city full of temples – some over 700 years old – I found it peaceful, the people friendly and the climate ideal. Finally, in 2011, I pulled up stakes in California and made Chiang Mai my permanent home. My goal: to change my lifestyle, live a calmer existence, eat better, become healthier, do only what I think is worthwhile, and live a happier life. Life here must be sanuk, or “fun.” In Thailand, this means much more than in the U.S. It reflects how life should be lived…work, life, shopping, doing anything should be sanuk. You should be able to derive satisfaction and pleasure from everything. The most common phrase in Thailand is mai pen rai, which means “it’s okay and doesn’t matter.” If you wait for the bus an hour and a half and it doesn’t come, mai pen rai – smile and relax. If two drivers have a car accident, they pop out of their cars, smiling – mai pen rai – and usually work it out calmly. 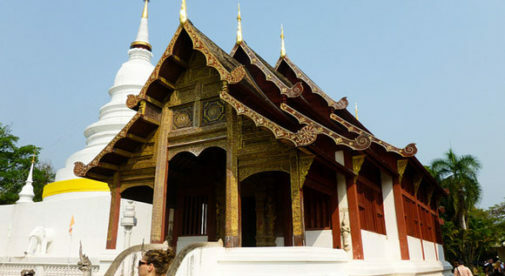 There’s so much to do in and around Chiang Mai. Much of Northern Thailand is blanketed in tropical forests with plenty of national parks and remote villages to explore. It’s a natural paradise with one tenth of all the animal species on earth. You can spend the day on an elephant farm taking care of an elephant, which includes bathing them in the river, feeding them and riding them out in the jungle. Or learn about Buddhism, historic Thai culture, massage or Thai cuisine. For long-term expats, good, affordable housing is important, and a comfortable, one-bedroom condo in a modern building with all the expected amenities (plus some) will run $300 to $600 per month in Chiang Mai. An “over-the-top,” luxury two-bedroom condo, with great views and 1,200 to 1,500 square feet, will rent for $1,000 to $1,200 per month. Many expats in Chiang Mai rent houses with yards full of tropical fruits and flowers. Numerous gated communities, located about six miles outside the city center, offer security, amenities, and a choice of spacious homes. Most are new, with three or four bedrooms, and rent for about $700 to $800 per month fully furnished. There are no distinctive “bad areas” in Chiang Mai. It feels safe for expats in almost any spot in town, and there is no specific “expat area.” Instead, expats live all over the city and are fairly well integrated into the community.